The Freedom Isn’t Free Tour featuring headliners Our Last Night will be hitting Crocodile Rock in Allentown on June 20th. 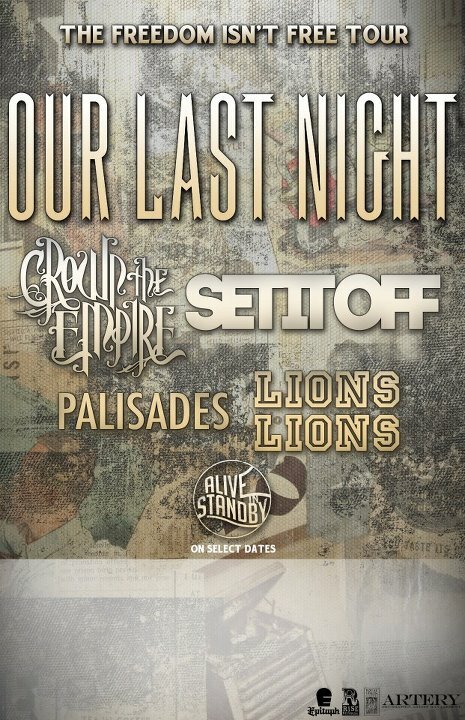 Opening for the show will be Crown the Empire, Set It Off, Palisades, Lions Lions, and Alive, In Standby. Our Last Night, a metal band from New Hampshire, began in 2004. They signed to Epitaph Records in 2007 and released their debut album, The Ghosts Among Us, in 2008. Their recently wrapped up recording and mixing their latest album which is slated to be released later this year.